Okay..I admit it...I frequently read the New Yorker just for the fun of the cartoons. It's something I'm not necessarily proud of...but since coming clean, I've found a support group of people who are closet cartoon readers. If "a picture is worth a thousand words" than what is the value of a mini-story that includes pictures (a la the form of a cartoon) worth? Ever wondered how political cartoons can zing home a point in a frame or two? Pulitzer Prize winner Jim Borgman gives you the scoop. Library Of Congress is currently exhibiting the works of Ann Telnaes. Ms Telnaes was the second woman to win the Pulitzer Prize for editorial cartooning, a highly competitive field in which fewer than 5% of the practitioners are women. Marketers have leveraged "comic ads" for many years as a tactic to cut through clutter and standout from the competition. 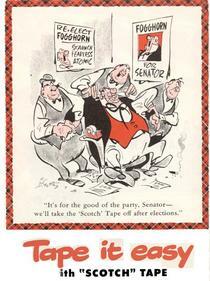 This ad for Scotch Tape from The Saturday Evening Post, September 11, 1948, combines both satire and advertising. I wonder if it would be PC to run during the elections of 2004. "Using humor in the form of cartoons is a powerful way to brand your marketing and drive home important messages to your prospects and clients," Roger C. Parker. I would add that to use humor effectively you must understand your target audience and ensure that the communication is aligned with the values of your brand. 1. When in doubt, leave it out. If the cartoon does not perfectly support your point, leave it out. 2. Always add the copyright information described in the licensing agreement. 3. Never run a cartoon without first obtaining a license to reproduce it. 4. Optimization. After downloading, resize and sharpen the cartoon in an image-editing program like photoshop and export it in the proper file format. -Marketing Prof's Know How Exchange ran a thread on "How Effective Is the Use Of Humor In Marketing Products and Services More Successfully?" Thinking about cartoons brings to mind the WSJ's fabulous illustrations...although not quite "cartoons"...I wonder why the WSJ Online doesn't include them. One more secret....I'd love a WSJ illustration of moi!